My Poulan weed wacker calls for Synthetic two cycle oil. I don�t mind since I don�t use a lot of gas but are others out there still using Dino with good results? Here is a photo of both Poulan labeled synthetic and cheapo Dino. What do you recommend? Last edited by Snagglefoot; 04/02/18 10:07 AM. Yes, lots of people still use conventional 2-stroke oil with no issues. A good oil is a good oil whether it is synthetic or petroleum based. There are not-so-good oils out there, but for a weed whacker, there's plenty of good options. 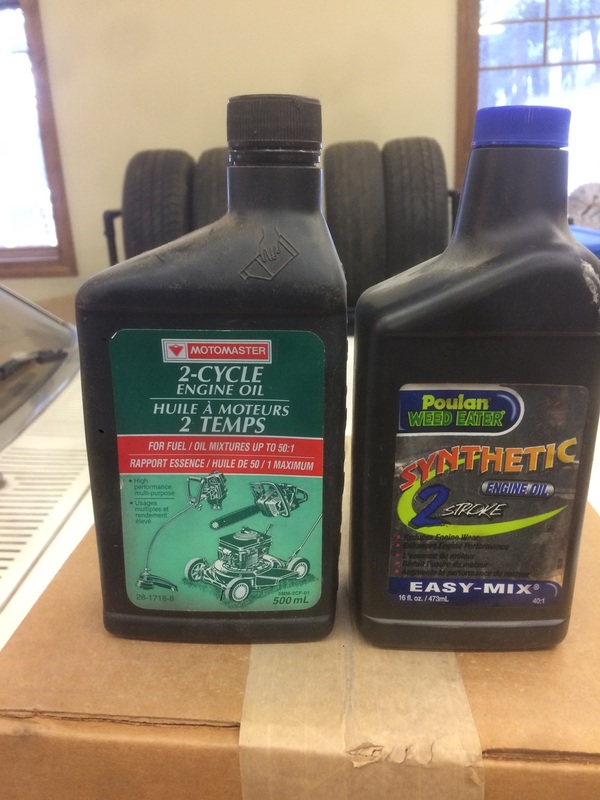 I ran a 50/50 mix of Poulan Synthetic Oil and dino 2-stroke for years. Ran well. My wife got 1/2 case on sale and I "extended" it with some other oil I already had. No issues at all. Clean piston crowns and no scoring in Husky, Echo, and Partner saws RedMax blower and Ryobi brush cutter. Last edited by BrocLuno; 04/02/18 11:50 AM. I agree 100% with BrocLuno. I always mix my gas and oil at 32:1 or 40:1 but never leaner than that. My last Craftsman weedtrimmer lasted over 20 years. Smoke is good and oil keeps them cleaner not carboned as they like you to believe. I run motul 800 2t in my 2 cycles at 32:1. It is ester based and it gives maximum protection and i even use it in my lawn boy 2 cycles. I've run Amsoil Saber synthetic 2-stroke in my Toro CCR2000 snowblower for several years without an issue. The same for my son's '78 Puch Maxi moped. Mixing 100:1 is kind of a pain (my RatioRite mixing cup doesn't have a convenient hash mark for 1.3 oz. into my 1-gallon gas can) so they get something closer to 75 or 80:1 Oil isn't fuel, so additional oil in gasoline actually makes the fuel mixture leaner, not richer. Last edited by khittner; 04/02/18 12:44 PM. Amsoil Saber in my LawnBoys and trimmer. Mix the cheap stuff at 40:1. I don't think I've used Stihl oil for 30 yrs. Latest is Valvoline Universal mixed to 32:! I use Amsoil as well for my Stihls. Best thing I ever did for them! Yrs ago I bought 100 of the 1 gallon add packs that mix with 1 gallon of fuel for 100:1. Saws always start and run great. Amsoil Sabre as well. Amazing stuff! JASO FD in my 2smokes. Echo or VP is all i use anymore. I have used Amsoil Saber for 10-15 years in my Echo Weed Wacker.